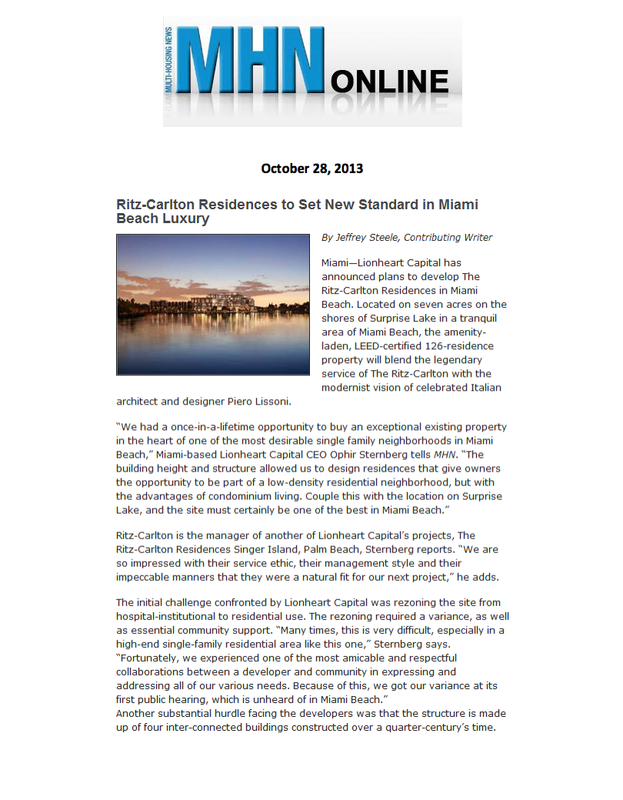 Miami—Lionheart Capital has announced plans to develop The Ritz-Carlton Residences in Miami Beach. Located on seven acres on the shores of Surprise Lake in a tranquil area of Miami Beach, the amenity-laden, LEED-certified 126-residence property will blend the legendary service of The Ritz-Carlton with the modernist vision of celebrated Italian architect and designer Piero Lissoni. Ritz-Carlton is the manager of another of Lionheart Capital’s projects, The Ritz-Carlton Residences Singer Island, Palm Beach, Sternberg reports. “We are so impressed with their service ethic, their management style and their impeccable manners that they were a natural fit for our next project,” he adds. Another substantial hurdle facing the developers was that the structure is made up of four inter-connected buildings constructed over a quarter-century’s time. Redesigning a building intended for institutional use to house the highest end of the residential market proved “an interesting proposition,” Sternberg recalls. The lakeside promenade and old-growth landscaping of the Ritz-Carlton Residences will also add substantially to the neighborhood and the property’s own curb appeal, Sternberg notes. “Residents will experience a low-rise community that offers the best of condo living, [with] no maintenance [and] luxury-living amenities,” he says. The penthouses residences are priced from $2 million to $25 million, with sales slated to begin when the on-site sales office opens in mid-November.